In general, a tumor refers only to abnormal growth of tissue that leads to swelling. The growth can be benign or, in the case of cancer, a malignant tumor or neoplasm. Abnormal tissue growth is caused by disrupted tissue homeostasis, where cell division outcompetes cell death. In malignant tumors, the underlying mechanism is the acquisition of mutations in proto-oncogenes and tumor suppressor genes over time. Mutations responsible for tumor formation and evolution are called driver mutations and are usually accompanied by passenger mutations that play no essential role. In their landmark reviews, Hanahan and Weinberg (PMID: 10647931 and 21376230) define two enabling characteristics, genome instability and mutation and tumor-promoting Inflammation, that lead to the eight hallmarks of cancer, defined in the table below. Stemming acquired capabilities necessary for tumor growth and progression is the key to treating many forms of human cancer, and investigational drugs are being developed to target each of the enabling characteristics and hallmark traits. Malignant tumors are classified according to their origin. Carcinomas, tumors originating from epithelial tissues (e.g., breast carcinomas), are the most common cancer type. Sarcomas are derived from mesenchymal tissues, such as skeletal muscle or adipose tissue. Neuroectodermal tissue can give rise to neuroendocrine tumors, such as small-cell lung cancer, and lymphomas are tumors of the lymphatic system, most commonly B- and T-cell lymphomas. In contrast, leukemias are a distinct cancer type that lack solid tumors. Rare tumor types, such as teratomas, are derived of undifferentiated stem or germ cells and involve multiple germ layers. For decades, tumors were viewed a collection of homogeneous cancer cells that could be understood by analyzing the intrinsic properties of these cells. Today, tumors are recognized as organs of similar or greater complexity than healthy tissues. The biology of a tumor can be understood only by studying all specialized cell types it contains, as well as its local microenvironment or stroma (PMID: 21376230). 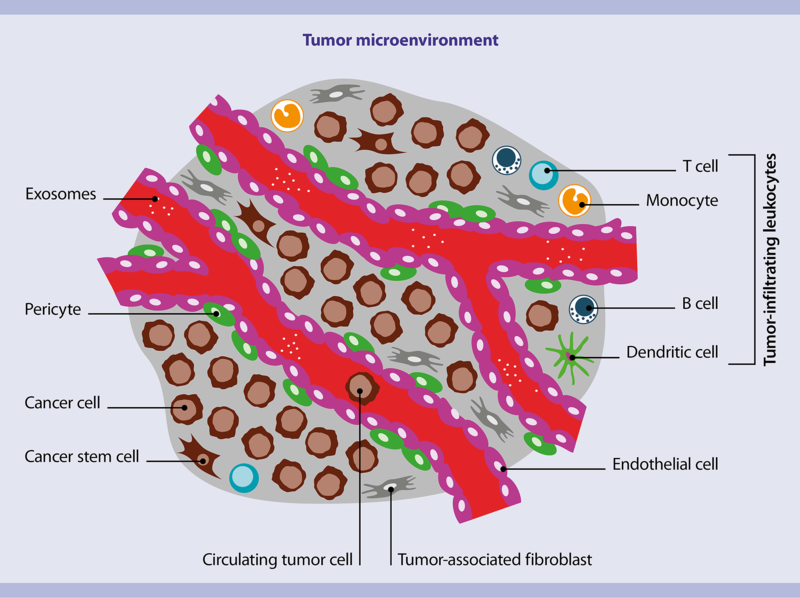 Cells of the tumor microenvironment. Solid tumors consist of several distinct cell types. Collectively, these cell types enable tumor growth and progression. Immune inflammatory cells present in tumors play a particularly important role, being able to both promote and arrest tumor growth (PMID: 21376230). A tumor has three layers of heterogeneity: intertumoral heterogeneity, akin to the heterogeneity among normal organs; interpatient heterogeneity based on differences in mutational profile, microenvironment and other factors; and intratumoral heterogeneity (PMID 24048066). Intratumoral heterogeneity is caused by intrinsic differences among distinct subclones of tumor cells, as well as the cell composition of the tumor and its microenvironment. Not all tumor cells of a patient or even of a solid tumor carry the same mutations. Instead, tumor cells provide diverse genetic and epigenetic characteristics subject to natural selection (PMID: 28187284). This clonal evolution further complicates the molecular analysis and treatment of solid cancers. The emerging model of tumors describes these genetically and epigenetically distinct clones coexisting in a hierarchically organized structure equivalent to normal tissue, with self-renewing stem cells at the top of a lineage organization (Monograph: Stem cells – from basic research to therapy, volume 2). Only this minority of tumor cells can regenerate and sustain tumor growth when injected into immune-compromised mouse models (PMID: 17875704). The first cells in the tumor hierarchy are called cancer stem cells (CSCs; PMID: 19064739). CSCs give rise to all daughter cells of the neoplastic lineage, and likely cause metastases and relapse after therapy (PMID: 16990388). Model refinements have correlated CSC phenotypes to epigenetic changes and epithelial-to-mesenchymal transition, thereby improving our understanding of tumor cell functional heterogeneity and plasticity (PMID: 28397828). Tumor cells in a solid tumor are frequently outnumbered by stromal cells, which generally include immune, fibroblast, and endothelial cells. For a detailed description of these cell types, see the MACS Handbook chapter Human cell types – Tumor cells. Characteristics of tumors are modeled in lab animals, most frequently mice, to better understand tumor biology, treatment, and resistance in less complex situations. Human tumor cells or tissues derived from established cell lines or directly from a patient’s tumor can be grafted into immunodeficient mice. These human tumor xenografts are the gold standard of research methods for areas like drug discovery, cancer stem cell biology, and metastasis prediction. Compared to in vitro cell culture models, human tumor xenografts show higher validity for most assays (PMID: 19005462). The major disadvantage of xenograft models is the use of immunodeficient mice as host. This implies a significant difference in basic tumor biology and prevents many aspects of immunotherapy research. To overcome this limitation, human tumor xenograft models can be generated in mice with a humanized immune system. Humanization is achieved by grafting PBMC or hematopoietic stem cells. However, these animal models are labor intensive, costly, and still hampered by an immature immune system, especially concerning the myeloid lineage (PMID: 27587540). Tumor tissues may need to be stored and shipped over prolonged time periods if specimens are collected from multiple sources, at different time points, or simply cannot be processed immediately. Necrosis, apoptosis, loss of stem cell functional capacity, and immune cell activation can occur during storage and thus bias downstream analysis. The MACS® Tissue Storage Solution provides optimized storage of fresh tumor samples without background effects, like cell activation or apoptosis induction. It has been tested and validated on a variety of human and murine tumor tissues. Cells per gram of tissue comparison between MACS Tissue Storage Solution and competitor products. Efficient dissociation of tumor tissue into a viable single-cell suspension is prerequisite for many downstream analyses, such as cell culture or flow cytometry. Enzyme-free, mechanical dissociation methods can release a portion of loosely connected infiltrating immune cells. More tightly connected cells, like fibroblasts, macrophages, tumor, endothelial, and dendritic cells, require proteolytic enzymes to efficiently break down extracellular matrix and cell-cell contacts. Crude digestion enzymes have variable specific and non-specific background activities, often due to contamination by other enzymes during manufacturing processes. As a result, some enzymes cleave cell surface epitopes relevant for analyses. In addition, frequently observed lot-to-lot inconsistencies can bias results of downstream experiments, from cell isolation to flow sorting and analysis. Miltenyi Biotec developed a straightforward method that combines mechanical dissociation and enzymatic digestion to yield single-cell suspensions with high numbers of all cellular subpopulations present in a tumor. The Tumor Dissociation Kit, human is combined with the gentleMACS™ Dissociator and gentleMACS C Tubes to quickly prepare single-cell suspensions from human tumors and xenografted human tumor material. Lot-to-lot consistency of enzymes and automation of the mechanical dissociation step ensure reproducible results. The method is also optimized for epitope preservation, proven for more than 200 epitopes. A list of preserved epitopes can be downloaded from the Related resources panel to the right to plan a high-quality downstream analysis.